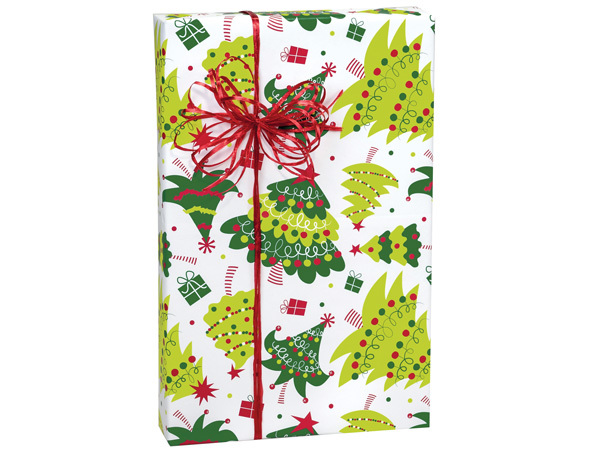 Jolly Christmas Trees counter roll wrapping paper. Green Way ® Eco-Friendly Packaging gift wraps are printed on minimium 40% recycled papers or papers sourced from well managed forests. Made in the USA. Our premium Christmas Gift Wrap papers are top quality and high design, all at competitive prices. Great wrapping paper for traditional or contemporary styles. These wraps are part of the Green Way® brand and are printed on paper sourced from well managed forests. Retail counter rolls measure 24" x 417' which can wrap approximately 175 -200 gifts. Smaller gift wrap rolls measuring 24" x 85' are packed in a storage box. These 24" x 85' rolls will wrap approximately 40-50 gifts.